Once upon a time there was an artist called Goldilocks. She hadn’t always been an artist so she felt very brave to be calling herself an artist now. And since she was an artist she needed art supplies. So she set off into the town to equip her new endeavour. When she stepped into the art supply store it suddenly felt like everything just got a little brighter and a bit more sparkly. Gleaming fat tubes of paint laid themselves before her in rainbow formation. Canvases of all sizes stood to attention at the far end. Rows of coloured pencils lay patiently on the counter, whispering “pick me, pick me”. Taking in a deep breath of paint scented air she set off down the aisles. She wanted everything! What did she need? Goldilocks ran her fingers over the rows of markers and chewed her lip. How much could I spend? How much should I spend? she wondered. Skipping through the abundance of supplies she could feel excitement bubbling up inside her. She wanted to try them all, but trying to be sensible, she decided to choose a variety selecting the very least expensive in every category. It’s not the tools, it’s the workman, right? Goldilocks ran all the way home. She couldn't wait to get started. She opened her cheap and cheerful sketchbook. It didn’t sit open very well so she pushed a bit at the spine in the middle of the spread of pages. The book creaked, and was that a little bit of a tearing sound she heard? Never mind, thought Goldilocks. I’m sure it's fine. It was only 3 bucks - bargain! She took out one of the shiny array of brand new coloured pencils and began to draw. She felt a little nervous - this drawing thing was still new to her, but she told herself she wasn't making real art, she was just sampling her supplies. She started to doodle some daisies across the bottom of the page. They seemed very pale. That’s fine, she thought. Probably best because I don't know what I am doing, really. And actually, this one looks wrong. Goldilocks had one more go at gently rubbing out her petal. She brushed away the erasings from the page. Oh no! The mark seemed to still be there in places but the paper wasn't! That eraser seemed to have damaged the surface of the page. Never mind, she told herself. I’m a beginner, I’ll just keep going. I’ll colour them in - then they will pop off the page like that Youtube lady’s did. She started colouring in a petal. The pencil was a deep pink but it made a very pale mark on the page. Goldilocks pressed a little harder to try and transfer more colour. That did work - sort of. But the coloured pencil scratched the surface of the page. So now there was a deep groove or two in an odd place on the petal. Determined to push through her creative challenges, Goldilocks opened her brand new watercolour paint box. Picking up her new paintbrush Goldilocks swished it in her water jug. Now she felt like an artist! Yes - paint must be my thing, she thought. She brushed across a red colour in her paintbox and then dabbed the paint on the petal waiting for the exuberant red splash to delight her eyes. Hmm, this is very pale too…. I’ll try again. Goldilocks swished the brush back over the hard cake of red paint in the paintbox and then inspected the tip. Still not very red. She tried again rubbing the paint a few times. This left a few hairs from the brush on the cake in the paintbox but she did seem to have more paint on the brush now. She dabbed it on top of the same petal. A big blob of red water sat up on the surface of the paper. She pushed at it again. Oops… another hole in the page! Goldilocks decided that perhaps her first painting session was over and started packing up all her shiny new supplies. Being an artist was not as fun as she had hoped. Later that week, Goldilocks tried again. She thought perhaps she was getting better and told herself it was okay to make very slow progress. She tried again the next week, but feeling increasingly despondent, she seemed to be getting less and less enthusiastic about art in general. Eventually, she concluded that she was making things hard for herself because she had chosen her supplies poorly. She returned to the art supplies shop and felt her joy return a bit. Having resolved to find the very best supplies she could, Goldilocks headed for the professional grade watercolour paint in tubes. It declared itself to be archival quality and had lots of technical information on the label. Goldilocks didn't know what any of it meant, but she knew it had to be the very best because this teeny tube of paint cost almost as much as the shoes she was wearing. Amongst the dazzling array of papers she looked for the most expensive paper she could find that was for watercolour. It was luscious. More like cardboard it was so thick, but just holding it in her hands made her happy. She gulped at the price and decided to only buy one large sheet, since it was so very expensive. Back in her studio, Goldilocks felt more like a professional. And as a professional she now had the right supplies. This time it would be much easier. She laid everything out neatly before her on her art table. She was about to start, but somehow she couldn't. Was everything quite right? Perhaps I had better rearrange things on the table so as to be more er… ergonomically appropriate. Ah yes, that's better, now let’s begin. She smoothed her hands over the unctuous paper. Oh, it is a marvel. I had better not mess it up. I only have the one sheet after all. Perhaps I need a snack so that hunger won't distract me from giving the painting its full attention. Fully refreshed by her snack, Goldilocks returned to her art space. She picked up the tube of paint and prepared to squeeze some out onto a palette. Imagining the size of the blob she would squeeze from the tiny tube she couldn't help but do some quick maths to arrive at the approximate cost of this blob. Gosh, better make sure I have something good to paint with it. Maybe I need to find a tutorial video… or even a book. Goldilocks opened her laptop and starting looking for guidance. An hour later, she realised that she had an appointment to get to. Oh dear. No more painting time today, but I will try again tomorrow. The next day Goldilocks tried again. Nervous… no, excited because she was finally going to do some proper painting with her proper supplies. But those proper supplies seemed to look at her with such expectancy. So much pressure. She had to get it right. Perhaps she needed practice before she began so that she didn't mess up those beautiful supplies? Every time Goldilocks thought about painting she couldn't help but worry that her art wasn't good enough to use these supplies, and sometimes she even wondered if perhaps she wasn't good enough. Goldilocks spent more and more time mulling all this over and slowly began to lose interest in being an artist. Sometimes she got out her art supplies just to see them and feel them but put them away with a sigh, usually settling for watching other ‘proper’ artists on her iPad, rather than painting herself. A few weeks later, Goldilocks was at a family gathering. Her little niece Audrey was there. It had been her fourth birthday earlier that week, and Audrey had been given a giant roll of paper for a kid’s easel and some lovely children’s paints. She proudly showed Goldilocks because she knew her aunt was an artist too. Goldilocks did her best to feign excitement for all things art and let Audrey show her all her new supplies. Audrey’s excitement was palpable, Ah, the naivety of youth, thought Goldilocks. But those glossy blobs of colour in that children's paint set were rather glorious. Audrey painted a bright splash of purple across her big piece of paper and giggled with delight. A vibrant swathe of violet had appeared on Audrey’s easel. Goldilocks watched as she added blobs of other colours to the page. The colours sang beside each other and filled Audrey with glee. Actually, Goldilocks was starting to feel a little more inspired too. Audrey had done three paintings already. Joyfully, effortlessly, as only a four year old could. She wanted Auntie Goldilocks to have a go. Goldilocks laughed and took the brush that Audrey’s pudgy little fist was offering. Channeling the carefree spirit of her niece, Goldilocks began swishing the paint across the page just like Audrey had done. She loved the feel of the smooth paint sliding over the paper. Just like Audrey, she wasn't worrying about how it would turn out, or whether it was good enough. She was delighting in the process. Audrey’s supplies were just right. Not so fancy as to be unapproachable. Not so inferior that they were difficult to use. They were children’s brand, so inexpensive, but good enough to be a joy to use. Price is not always the best indicator of quality. Goldilocks learned some of her most valuable art lessons that day. She learned to use the right art supplies - not the ones that are too fancy, not the ones that are too inferior, but the ones that just feel wonderful to use. And to always, always paint like a four year old. Are you thinking of beginning your own creative adventure? 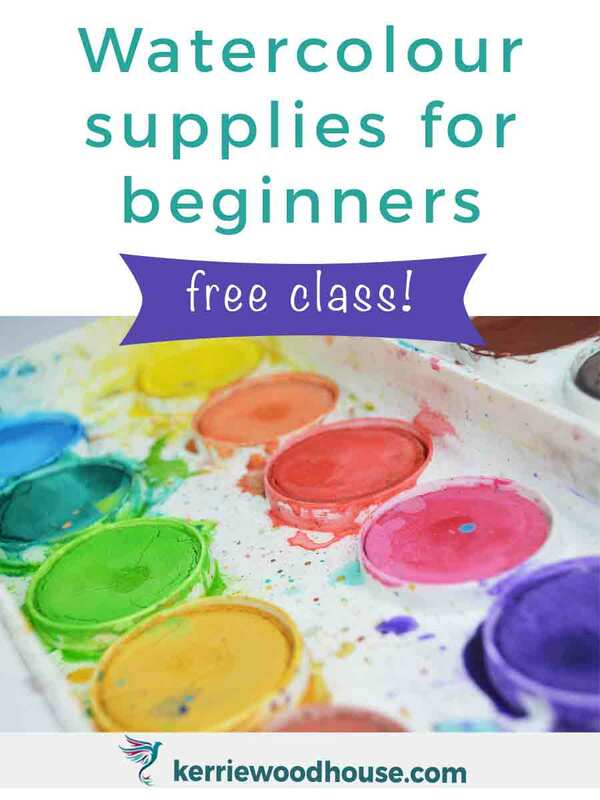 How about a free supplies class to get you started?